In the past Topps Supreme Baseball has come with expectations that are lower than some other premium products due to design and use of sticker autos. 2015 Topps Supreme Baseball way exceeds those expectations and is revamped to feature on-card autos and skillfully don't multilayer edging, thus ending the need for on-card hit seekers to wait for other high end products. 2015 Topps Supreme Baseball fits into our Premium Cards category. This Hobby Exclusive comes with 1 pack per box, 2 cards per pack, both autographed cards. If you collect Bowman you are an early adopter, someone who needs the first of anything. That is mostly what this product has going for it. A prospectors’ set and designed for rainbow collectors and first card seekers, 2015 Bowman Football has a built in, very defined audience. One that doesn't care about rookies without team uniforms or even jersey numbers, mammal design element but consistently delivers what it is expected. For some the better option is to wait for Topps flagship football product, avoiding the role of the dice on players, some of whom don’t even make it past the draft. But at 4 autos a box, there is enough to compensate. 2015 Bowman Football falls under our classification of trading cards. There are several configurations of retail and hobby exclusive packaging. We opened a hobby box of 10 jumbo packs with 25 cards per pack with the promise of four autographs and one relic card. 2015 Topps Gypsy Queen Baseball Cards is now in its fifth year. While this is still a set builders look forward to putting together, some of the early elements that made it fun and different have been dropped leaving this just another option in a wide variety of cards to collect. Unfortunately without those elements (who remembers the original speculation about the Gypsy Queens and Kings?) there are many similarities to other releases so we might see GQ start to take a back seat to others. What continues to make this a desirable product, and saves it in many ways, are the on-card autographs. For 2015 Topps has taken their flagship product, Series Two Baseball Cards, in what appears to be a different direction from previous years when it comes to design, electing to go with bold graphics and plenty of color. We like that direction. This also makes it way to inserts and base auto hits. Another change is the expansion of the base card set from 330 to 350 base cards. Manufactured relics return and look great as do Coin & Stamp cards and Photo Variations. With great photo selection and cropping this year all of this adds up to one of the better Series on sets to come along in a while. For the purposes of this review, we classify Series 1 as trading cards. There are a wide variety of configurations in both retail and hobby. We opened a box hobby box which contained 36 – 10 card packs with a promise of 1 autograph or 1 relic card per box. I’ve always enjoyed the nostalgia of Topps Archives Baseball. Yes, this sort of thing is done with Heritage and other reprint inserts but Archives allows for seamless interchangeability between players photos and card styling from different decades done in combinations you don’t see in other products. 2015 Topps Archives Baseball Cards concentrates on previous design years of 1957, 1976 and 1983 with a little bit of 1990 thrown in as an insert. It still provides a reasonable challenge for set builders, while also servicing hit seekers looking for fan favorite pulls that can’t be found anywhere else. For collectors who were around during the original releases of these cards, this redo will feel familiar while, at the same time, seem current and should bring back feelings of when you first opened these packs. Unlike the popular Heritage line, collectors won’t have to wait 50 years to see their favorite releases get the updated treatment. This year Will Ferrell’s stadium hop playing all positions is featured along with buyback stamped and autographed cards. Archives Baseball falls under our classification of trading cards. Hobby Boxes contain 24 – 8 card packs with 2 on - card autographs per Hobby Box. Here are some of the cards we pulled from our hobby box. For the modern card collector, the foundation of what started the hobby, the base card, can often times be overlooked. All one has to do is watch box or even case breaks and the breaker rushes through the cards to get to the hits, only to sort the base cards later, perhaps even give the option to skip them all together. The base cards are simply ignored. With 2015 Topps Stadium Club Baseball it is impossible to ignore the base cards. They are stunning. Largely due to the photography as that is more prevalent than with any other card, these full bleed cards with little enhancement pop as you look at them. Kind of like the best type of cooking, with the photo as the star there is little need for embellishment. But you wont get short changed on the hits either. 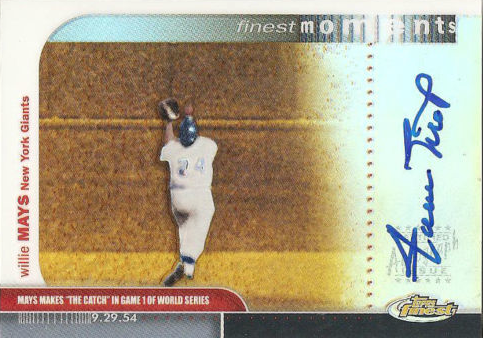 Fully realized on-card autographs and the return of Lone Star Autographs provide plenty for hit seekers. All of this will make set builders very happy as well as those looking to pull a great auto. Stadium Club falls under our premium cards category with each master box containing18 packs with 8 cards per pack and two on-card autograph card per box. Here are some of the cards we found in our box. 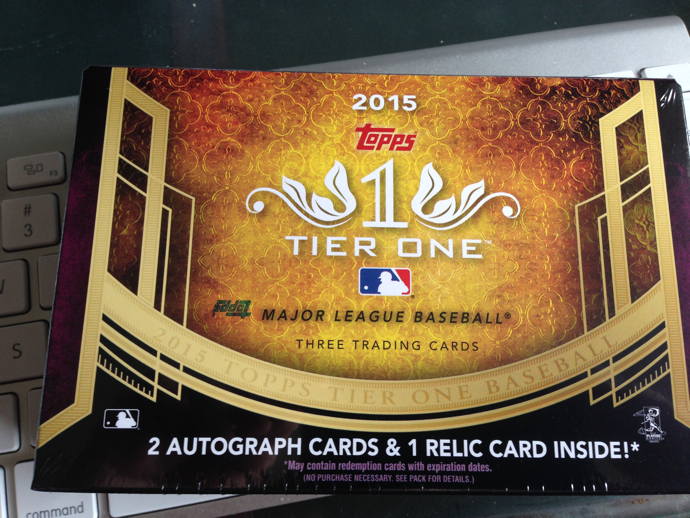 Each box of Tier One Baseball contains 3 cards, two autographs and one relic card. Certain boxes will contain an extra relic hit for a total of 4 cards. Here are the cards we found in our box. Topps Museum Collection Baseball cards are now a standard collector favorite. 2015 Topps Museum Collection Baseball doesn’t disappoint, providing sharp design and a nice variety of great looking hits, excellent photo selection all around and a cohesive set that does justice to it’s Museum moniker. Collectors should be familiar with Topps Supreme Football by now. This 1 pack - 4 card - 1 hit wonder provides a nice middle road for collectors looking to take a chance on pulling a big hit but wanting a price point that is closer to a hobby box of standard cards. 2014 Topps Supreme delivers this with good design but the trade off is sticker autos for veteran players, but the rookie class is on-card. 2014 Topps Supreme Football fits into our Premium Cards category. This Hobby Exclusive comes with 1 pack per box, 4 cards per pack, with 1 autographed card. It’s time for another installment of Throw Back Thursday Vintage TBT Cards. The player on our card for today, March 12, 2015, is Cal Ripken Jr. This is his Topps rookie card. I pulled this from packs back in 1982 Herd to believe that was over 30 years ago. Let’s take a look at this card. It's Monday, a day when hope springs eternal. Hope that this week will be perfect. It's also the perfect time to look for perfect cards. It's what we call Mint Monday. Last week we wrote about the1986 Fleer Michael Jordan Rookie card. 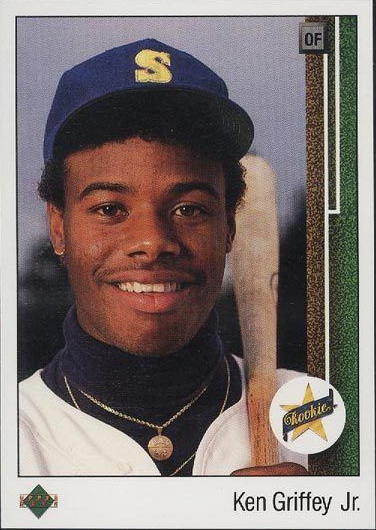 This week we tackle another ‘80s icon, the 1989 Upper Deck Ken Griffey Jr. Rookie Baseball Card. It’s Free Dress Friday here on All About Cards. That means anything goes. So put on your casual clothes and let’s look at the lighter side of Trading Cards. In the past week All About Cards has been all about 2015 Topps Heritage Baseball. From a mobile friendly checklist to Action Image Variation Visual Checklist to a post on How To Spot 2015 Topps Heritage Error Cards. We predicted all the error cards before the release of 2015 Topps Heritage in rather detailed form, but there was one error card we were hoping would be a little different. It’s time for another installment of Throw Back Thursday Vintage TBT Cards. It’s been all about the release of 2015 Topps Heritage Baseball this week from our mobile friendly checklist to a guide for finding error cards. So let’s pay tribute to the set Heritage is based on this year, 1966 Topps Baseball. 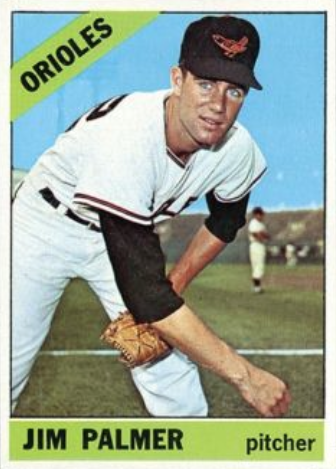 We covered this card, Jim Palmer’s rookie card from 1966. He is not the only Hall of Famer to have a rookie card in the ’66 release, there are two others. But when it comes to pricing, all three of those cards are eclipsed by another rookie, one that you might not even know about. Let’s take a look at those cards. 2015 Topps Heritage Baseball Action Image Variation cards are easy to spot but only if you’ve seen the base version of that card. It helps to find the code on the back of the card. This year that code ends with 262 unlike the base cards which end with 253. But rather than just hunting for tiny codes on the back, we’ve made it simple for you to spot these cards by making a complete visual checklist of these Action Image Photo Variations. As an example for comparison, above you will find the base card and Action Image Photo variation for card #1, Buster Posey. Below you will find all the Action Image Photo Variations alone, without base cards. If you think you have an SP Action Image Variation but you don’t it find here, it’s just a nice looking base card. And we've made it even easier to get any of these cards, without having to hunt through packs. Click on any of the player's names below and that will take you to all available versions of that card currently listed on eBay. Many of them are Buy It Now options so you could have that card delivered to your door. 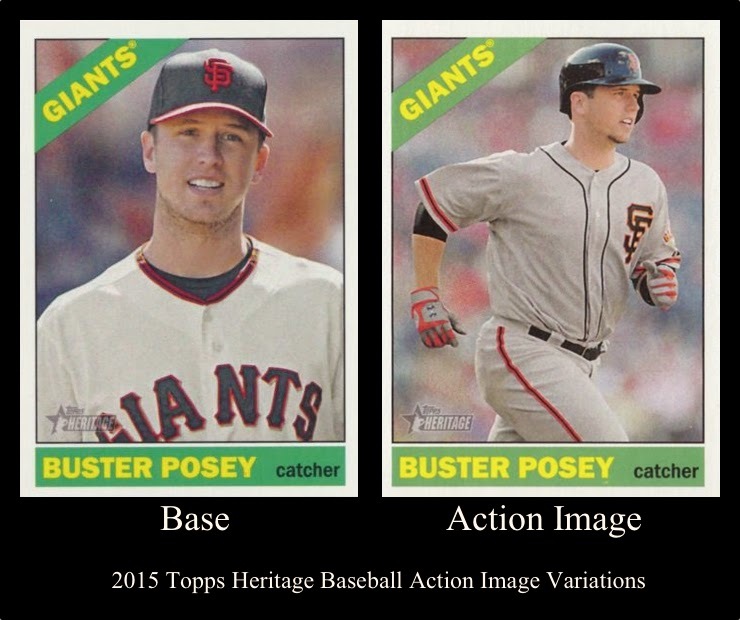 Here is our 2015 Topps Heritage Baseball Action Image Variation Complete Visual Checklist. Here is our 2015 Topps Heritage Baseball Cards Complete Checklist. We have designed this for your ease of use and ability to find exactly the information you need without having to go through the entire list is your don’t want. That also makes it very mobile device friendly. It was made to help you look up what ever you need on your phone everywhere you go. It's here and it can be yours. 2015 Topps Heritage has hit eBay. Here is a look. If you want these, click on READ MORE to get the link. Let's kick off the week with this PSA 10 1986 Fleer Michael Jordan Rookie card. It’s late, but it’s still Sunday here and we are getting this Signature Sunday post just under the wire.. This week 2015 Topps Heritage Baseball releases. Rather than wait for next Sunday when the cards are live. we’ve decided to look at previous Heritage cards for one of our favorites, Real One Autographs. So let's take a look at some of these autographs. For 2015 Topps has taken their flagship product, Series One Baseball Cards, in what appears to be a different direction from previous years when it comes to design, electing to go with bold graphics and plenty of color. We like that direction. This also makes it way to inserts and base auto hits. Another change is the expansion of the base card set from 330 to 351 base cards. Manufactured relics return and look great as do Coin & Stamp cards. Sparkles and Photo Variations also make an unannounced return. With great photo selection and cropping this year all of this adds up to one of the better Series on sets to come along in a while. With 2015 Topps Heritage Baseball releasing next week, collectors will be opening packs trying to find the error cards that mimic and parallel the errors made in the 1966 Topps Baseball release. Because these new Heritage error cards are unannounced, the hardest part, most of the time, is spotting them. I was the first to spot one of these cards back in 2011. I did a post about it called Mysterious ARod 2011 Topps Heritage Card Surfaces on eBay. At the time the card was on its way to being sold for a little more than $10. That auction ended early. When it was understood to be an error mimic card it sold for more than $300. So rather than wait until after the release of 2015 Topps Heritage Baseball, we have decided to provide for you a guide with a checklist of cards that could contain errors. We've divided them into four categories, Hight Alert for cards that are almost guaranteed to have error variations, Possible Errors for cards that look like good candidates for error SSP cards, Longshots for cards that have an outside chance of being included as an SP and Conditional Longshots for cards that could have an error variation but depend on certain elements being present. All of this is based on what we know about the original error cards from 1966, what we know about the 2015 Topps Heritage Checklist and how previous releases of Heritage have handled errors. Until these cards are discovered and confirmed, check these card numbers very carefully. In the past two weeks when we introduced you to “Actual” Error Cards. Not player cards that contain errors but cards that contain player’s errors. We received some great feedback on that post, but it might be time to look at some real error cards. Yes, the ones that contain card errors. With 2015 Topps Heritage Baseball releasing next week, collectors will be looking at cards in the style of 1966 Topps Baseball. One really fun aspect of Heritage from year to year is discovering the unannounced error cards. These cards are SSPs and mimic the error cards from the year Heritage is honoring. Because these cards are unannounced, collectors slowly find these cards as packs are opened. The hardest part, most of the time, is spotting them. Many people race to get their cards up on eBay to try to take advantage of higher sales prices for being first to market. With Heritage this can be a costly error as some cards sell for the price of their normal base card counterparts. I was the first to spot one of these cards back in 2011. I did a post about it called Mysterious ARod 2011 Topps Heritage Card Surfaces on eBay. At the time the card was on its way to being sold for a little more than $10. That auction was eventually ended early. When it was understood to be an error mimic card it sold for more than $300. So for Free Dress Friday we will focus on the original errors from 1966. Later today I’ll give you my predictions for which cards will be error cards in 2015 Topps Heritage Baseball. (I got over 80% of them last time.) All of this will be followed up with a Complete Checklist for 2015 Topps Heritage Baseball this weekend and Complete Visual Checklists for the Throwback Uniform, Action Image, Color Swap and Error Mimic variations shortly after next week’s release. Now let’s look at the original errors from 1966 Topps Baseball. It’s time for another installment of Throw Back Thursday Vintage TBT Cards. The player on our card for today, February 26, 2015, is Ted Kluszewski. This is not his rookie card. You have to go back to 1949 Leaf for that. But this card was around well before my time so it works for me. This is as far as I can throwback Kluszewski from my PC. For Topps Series One Baseball cards since the inclusion of Sparkle Variations in 2011, collectors have had a hard time spotting these sparkles? We admit, they are tough to recognize and at first we didn’t spot a card we pulled from a hobby pack this year’s 2015 Topps Series 1 Baseball. So how can you tell if you have a true sparkle? The only thing that helped us find it was to check the code on the back of the Sparkle card. This year that code ends with 903. Upon further inspection we also noticed that 21 out of the 50 Sparkle SP variations include a shift in sides of the Topps logo, which we detailed in an earlier post. We have done complete visual checklists in the past, showing you the key places to look on the card to find the Sparkles. We’ve decide to do another Complete Visual checklist for 2015 Series 1 Baseball Sparkles as they seem to be a bit smaller, perhaps tiny compared to other years, and seem harder to spot. We will also be doing one for the 25 Photo Variations later this week. An asterisk has been put at the end of the player name on the checklist if that card is one of the 21 that have a Topps logo that shifts. This checklist is complete so if you think you see a Sparkle on a card that you don’t find here, it’s just a natural light photographic reflection and not an actual sparkle. It’s Wednesday so it’s time for another installment of Hump Day Hits. Before we get to the new cards for this week, here is a small update on a post we did two weeks ago when we covered Willie Mays Certified autograph cards. At the time we told you we had tracking the street values for his autograph cards and there seemed to be an upswing in prices. Not long after that post prices seemed to follow that trend as we saw certain autographs push to $300 and more. Well here is one card that ended in the day after our post, and there is no way we could have anticipated what would happen. We had full faith in you collectors and you did not disappoint. The vast majority of you nailed it, that the card on the lower left is different. But the interesting part of this exercise was what you told us makes the card different. Allow me to explain. Hello kids! 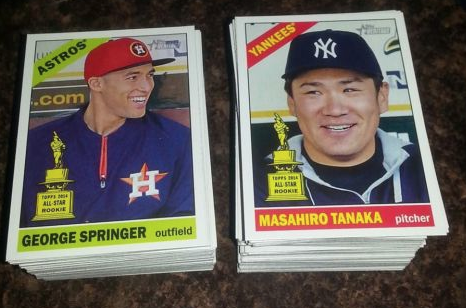 Let's play a game with 2015 Topps Series One Baseball Cards that most of you will remember! When a show is watched by 43 million viewers, it is hard to ignore it’s impact so we would be remise if we didn’t make the Oscars the focus of this week’s Signature Sunday. Tonight gold statues will be handed out solidifying participants places in movie history. While plenty of categories will be awarded, most people are interested in the Awards given to the actors. But most of the actors nominated tonight worked their way through the ranks to get to this moment, working on more mainstream projects. When that happens there tends to be a trading card or two that get signed As it turns out this year the majority of the frontrunners for Oscar gold have certified autograph trading cards. Of those that do, the majority of them are Rittenhouse Archives cards. So lets take a look at some of these autographs. Last week when we introduced you to “Actual” Error Cards. Not player cards that contain errors but cards that contain player’s errors. We received some great feedback on that post. Someone “in the know” who has ties to one of the trading card companies liked the idea but thought the league would never go for it. I found that funny because that was my exact thought as I was creating those cards. Then I found this card. Floating heads. When you hear that, what’s the first thing that comes to mind, besides certain movies. If you thought of '60s Baseball cards you are ready for our Throw Back Thursday Vintage TBT Card. Some of you may remember we are participating in a year long challenge/game called Wallet Card. We adjusted the rules to give it some more meaning and we've instituted an official day to catch up which we call Wallet Card Wednesday. For this installment we are doing a bit of a throw back. This is the fourth of eight posts where I’ll detailed for you one of my latests adventures in the hobby, Micro Collecting certified on-card autographs of all of the New York Rangers with Retired numbers. There are eight players and they are Eddie Giacomin, Brain Leetch, Harry Howell, Rod Gilbert, Andy Bathgate, Adam Graves, Mark Messier, and Mike Richter. Totday we will take a look at Mark Messier, number 11. Here are the Zen Cards of the Day. Let this theme take you to another place. Use these anchor words to find serenity now. Repeat over and over again. Here is the entire checklist with all the info you will need on the contents of a box of 2014 - 2015 Topps Star Wars Masterwork Trading Cards. 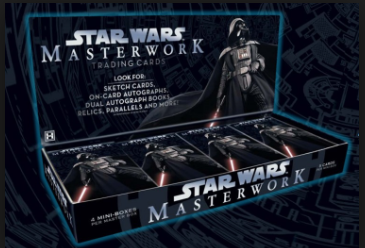 Star Wars Masterwork is the most premium Star Wars trading card set ever created. Collectors will find on-card autographs from 40 of the actors to appear in the Star Wars movies including Mark Hamill, Harrison Ford, Carrie Fisher, James Earl Jones, Billy Dee Williams and the actors behind the the characters of C-3PO (Anthony Daniels), R2-D2 (Kenny Baker), and Chewbacca (Peter Mayhew) just to name a few. There are also authentic pieces of the bunker from Return of the Jedi embedded in cards, original one of a kind artist's sketch cards and a 105 card base and insert card set printed on heavyweight premium card stock. It’s Free Dress Friday here on All About Cards. That means anything goes, like last week when we introduced you to Puppy Bowl Trading Cards. So put on your casual clothes and let’s look at the lighter side of Sports Cards. Collectors love to chase rare cards. Nowadays that can be low numbered serial cards, short printed cards or a host of other cardboard oddities. But the one rarity that collectors have chased that has withstood the test of time is the error card. This is when the manufacturer misses something and that mistake finds it’s way into packs. Sometimes these errors are eventually corrected. Sometimes they are just accepted and left that way. Here is our Throw Back Thursday Vintage TBT Card for February 5, 2015, Stan Musial. Not his rookie card. You have to go back to 1948 Bowman for that. But this card was around well before my time so it works for me. This is as far as I can throwback Musial from my PC. 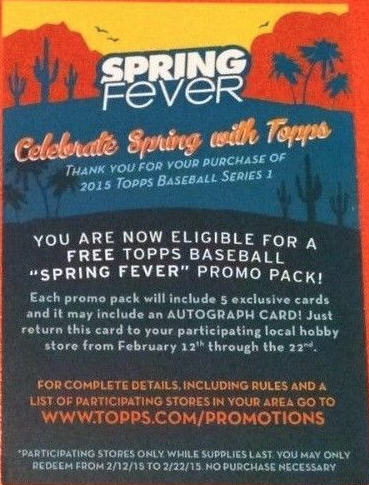 The Spring Fever hobby-shop promotion kicks into another gear this week. Collectors who purchased at least $20 worth of 2015 Topps Series 1 Baseball from participating hobby shops received a redemption card to get a five-card Spring Fever promo pack, and they can pick up their packs starting today. The 50-card Spring Fever checklist highlights players in their spring training cities, but there is also something else collectors may notice. Today is Wednesday so it's time for another installment of Hump Day Hits. 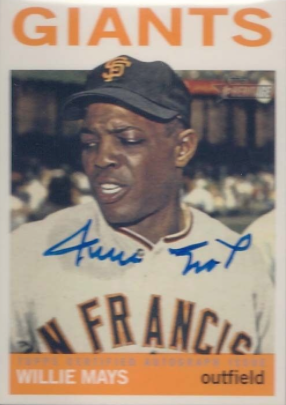 This week we focus on Willie Mays Autographed cards. 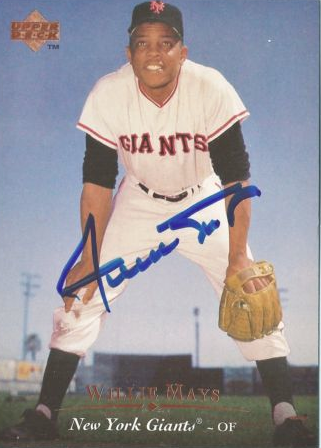 With a signature that is stylized and instantly recognizable, Willie Mays has been a collector "must have" for years. He has also had a special relationship with the Topps Company dating back to his rookie days, thanks to Sy Berger. Mays will be 84 in May but still signs for Topps and should be included in upcoming releases. In tracking street values for Mays autographs, there seems to be an upswing in prices. Some cards that were going in the $120 to $150 range have recently sold closer to $200 and above. No one can say if this trend will continue, or even drop back down, but it could be cause enough to consider these cards if you have thought about or are in the market to purchase a Mays auto. Mays has signed plenty of dual autograph cards with players such as Hank Aaron, Ernie Banks, Stan Musial and Duke Snider, but today we will concentrate on his single signed certified cards. Let's take a look at some of them. We’ve been tracking sales of 2015 Topps Series One Baseball cards on eBay since their release a week ago. Sales have been moving briskly with everything thing from sets to singles. We did several posts throughout the week following how the cards were moving which you can revisit like our coverage of the hottest hits to the popular autographs to the fastest moving cards on the first day of availability. Now we will look at the best sellers for the week and the top seller might not be the card you would think it would be. Here are the Zen Cards of the Day. Today we focus on 2015 Topps Series One Baseball. Let this theme take you to another place. Relax your ‘Monkey Mind” with these anchor words. Repeat over and over again. Last year the design of Bowman Sterling Baseball was straightforward, a player and his autograph. This year the backgrounds are exploding with whirlwind design. But something remains the same, it’s knowing exactly what you are getting with each box, consistency within prospect collecting, and the whole point of Sterling, 18 autographs in a hobby box. All of this makes 2014 Bowman Sterling Baseball a solid, reliable product for hit seeking Bowman prospectors. 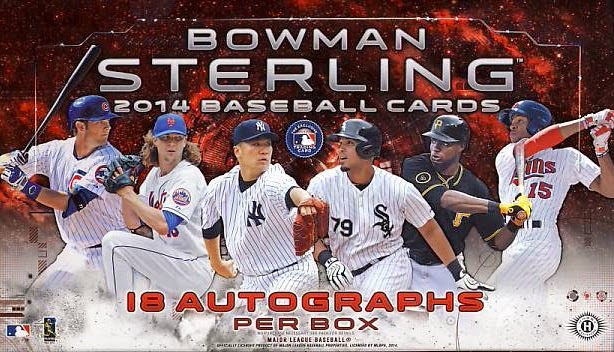 Bowman Sterling Baseball comes in at the high end of our premium cards category. Each hobby box contains 6 packs with 4 cards per pack. Each pack contains 3 Autograph Cards. There are also Box Toppers to be found, but not in every box. 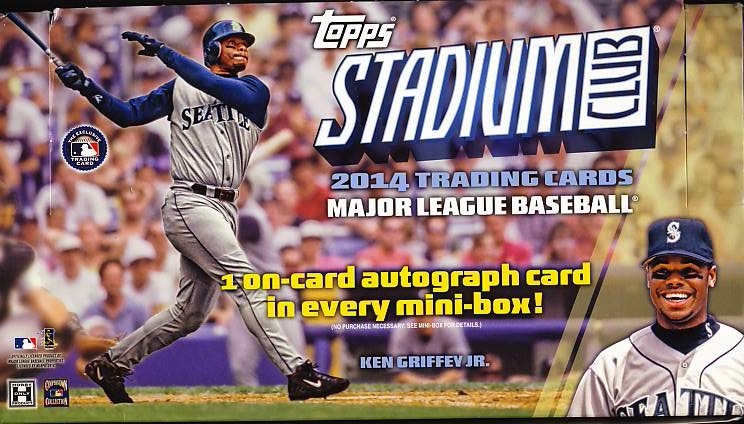 Besides the larger releases of Five Star and Dynasty, 2014 Topps Stadium Club was one of the last Baseball products to be offered by Topps to collectors. It revives a brand previously know for it photography. Stadium Club was also know for it's tough Lone Star Autographs. All of this returns to a product that tries to find its way into an already busy marketplace with cards that would make set builders very happy, but also comes with a price tag to accommodate the 3 autographs included, all on- card. Stadium Club falls under our premium cards category with each master box containing 3 mini boxes. Each mini box contains 6 packs with 5 cards per pack and one on-card autograph card. Signature Sunday Focuses On 2015 Topps Series 1 Baseball Autograph Cards. Clearly this week's Signature Sunday was going to be all about 2015 Topps Series One Baseball Autograph Cards. Collectors and Box Breakers have been attaching packs in large numbers. Autographs are making their way into collector's hands and eBay listings. A good sign has been autos have been selling briskly on the "Bay" and stratospheric prices seem to be leveling in to the reasonable range. On the way home late last night I toyed with the idea of trying to track down some 2015 Topps Series 1 Baseball cards in retail form. Yes, I'll crack hobby packs but I prefer to grab some store bought packs to start things off. It's a ritual that reconnects me to my childhood growing up in New York when I would go into the Woolworths or even the pharmacy across the street from my school looking for cards placed in the candy aisle. Times have changed but I still like this tradition. Here is our Throw Back Thursday Vintage TBT Card for February 5, 2015, Joe Namath. They are not swatches of jersey, they are cards that simply look great. Let’s start with some retail finds. 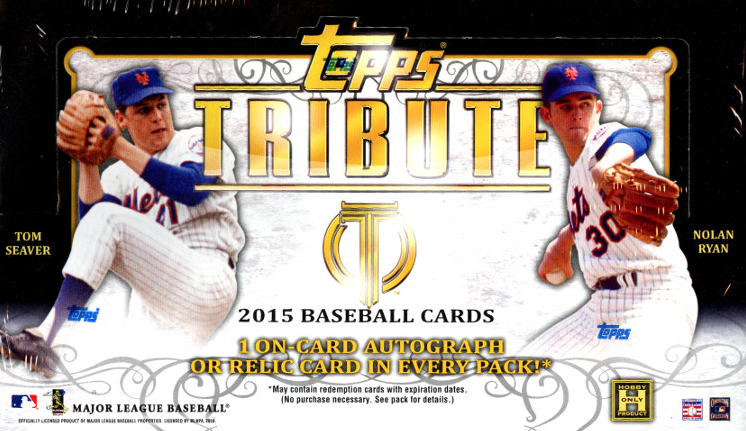 2015 Topps Series One Baseball is live. Cards are flying onto eBay and before it even hit midnight n the West Coast, sales had happened. A Miguel Cabrera Gallery of Greats Auto Relic Redemption Card sold for between $230 and $249. The highest price paid for a non reception, live, pack pulled card was $70 for a Chipper Jones Career Highlights Autograph. A wide variety of First Pitch Inserts, First Home Run Inserts, Coin card, Pin cards. and a few serial numbered parallels. Sales have been brisk but reasonably priced for first to market cards. We've compiled a list of the hottest eBay auctions with some of the first cards to hit the market. Here is what you will find. Here are the Zen Cards of the Day. Let this theme take you to another place. Relax your ‘Monkey Mind” with this anchor word. Repeat over and over again. To get your week off to a good start here is our Gem Mint Monday card of the day. 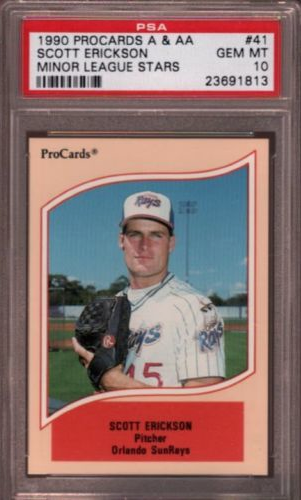 It's a Gem Mint PSA 10 1990 ProCards A & AA Minor League Stars Scott Erickson #41. Today happens to be Scott's birthday. He turns 47 today. This Southern California native became an All-Star pitcher and World Series champ with the Minnesota Twins in 1991. He also co-lead the league in wins that year. On April 27, 1994 he pitched a no hitter against the Milwaukee Brewers, recording 5 strikeouts and was just 4 walks shy of a perfect game. Erickson went on to pitch for the Orioles from 1995 to 2002 and shuffled between the Mets, Rangers, Dodgers, and Yankees before hanging up his cleats. Currently Erickson is a Movie Producer with a production company called "HomeTeam Productions." His company produced the movie "A Plumm Summer" He has also developed an app that provides professional coaching called Major League Mechanics. So let's talk a little about this card. It's Signature Sunday here at the blog and I have to pick autograph cards appropriate for this day. It's kind of a no brainer, really. First there is this card. 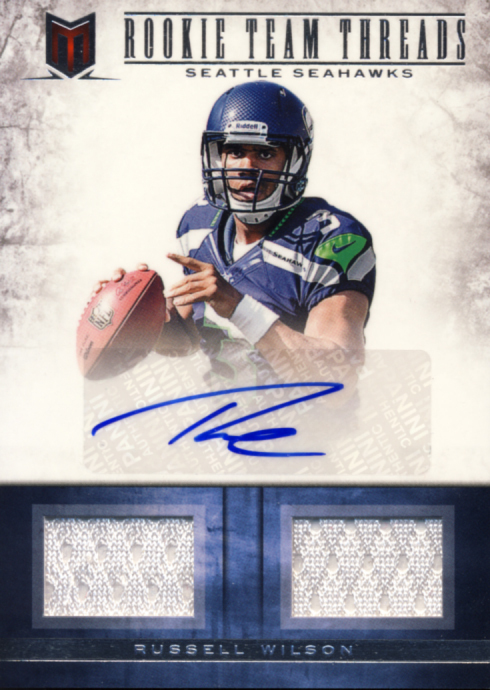 It's a Russell Wilson Rookie Team Threads Auto from 2012 Panini Momentum Football. Funny thing is that at the time I pulled a dual and single auto of veterans in the product, and Russell Wilson was unproven at that point, so I considered this the 3rd best hit of the box. Looking back at that box, which you can do too by following this link, that outlook has changed. And now for that other card. It’s Free Dress Friday here on All About Cards. That means anything goes. With this huge sports weekend just about to start we would be remiss if we didn’t share with you cards of some of the biggest names to be taking the field this weekend. Names like Bubba, Freckles and Mr. Fantastic. Of course we are talking about Puppy Bowl XI. Seen by 13.5 Million viewers, this canine contest has withstood the test of time. It's no small production. The Puppy Bowl uses 17 cameras, including the now famous water bowl cam to put viewers right into the action. Over 90 hours of footage is shot during two days of production. On the field there is a rotation of 95 rescue puppies between 12 and 21 weeks old, 21 kittens, 5 goats and 5 hamsters. There’s even an up to the minute Twitter feed run by a bird named Meep. There is also a Puppy Bowl Fantasy Game that you can play. The main goal, besides providing cuteness overload, is to bring awareness to pet adoption through animal shelters. It’s impossible to accurately measure the impact this show has had but without a doubt untold fabulous pets have been placed in permanent homes thanks to the Puppy Bowl. With all that goes into the making of the Puppy Bowl and the amount of fans that watch, how on earth are there no Puppy Bowl trading cards? It’s not such a far fetched idea. especially with this year’s introduction of two opposing teams, Ruff vs. Fluff. That’s were we come in. Always looking to help collectors, we have created the complete unauthorized 2015 Puppy Bowl XI trading cards, at least digitally. The set comes includes base cards, SP variations, inserts and autograph cards. Enjoy this sampling for now. The choice of Ernie Banks this week is an obvious one. When we lost Mr. Cub this week, we lost a large icon that represented the love and fun of the game. This is as far as I can throw it back, for now, from my collection. It's the 1961 Topps Baseball Ernie Banks #350 which is slightly better than the look of the scan. It's still in a 4 screw down holder with a bit of a scuffed up top. Enjoy this throw back vintage and check in Thursdays for more Vintage TBT cards. In honor of Awards season, here is our Hump Day Hit. 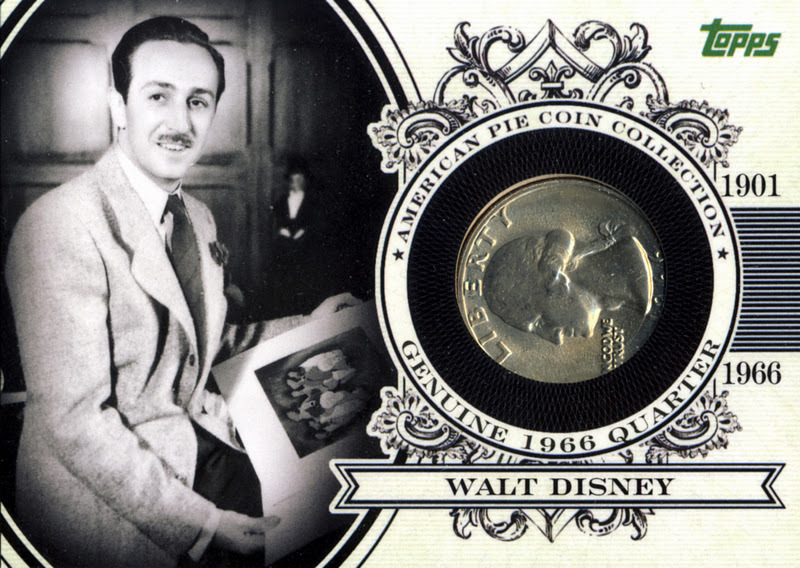 It's a Walt Disney 1966 Quarter Coin Card #/25 from the still fantastic 2011 Topps American Pie release. To check out other cards in this set along with a box break recap and review of 2011 Topps American Pie cards, use this link. Here are the Zen Cards of the Day with Last Name word play. When you obtain clarity and receive enlightenment, let us know in the comments below. I’ve been hearing about people having trouble downloading the PDF checklist for 2015 Topps Baseball Series 1 from the Topps site. I have it so I’ll share it. For additional checklists of previous releases make sure you check out Sport Cards Radio. (Use this link to check their stuff out.) The PDF was LONG, there are a lot of cards and inserts, so I’ll give everyone three options to see the checklist. - to view ALL of the cards on one page. Warning, it's a lot to load at one time, especially if you are on a mobile device. The next two options may be better for you. 2 - I’ve divided the cards into groups. Use the links below to look at a small section of cards at one time. You can always come back to this main page to find the link for another part of the list. Hope this was helpful. Make sure you return when we publish our yearly "Everything you need to know about" post on 2015 Topps Baseball, series 1, 2 and Update.